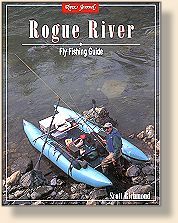 "Rogue River, Oregon - Great Rivers - Angler's OnLine"
The Rogue River can be a confusing place for fly anglers. Fresh anadromous fish enter the river every month of the year. Early-arriving spring salmon swim with the last of the winter steelhead. Summer steelhead head upriver cheek-to-jowl with the end of the spring salmon. The first fall chinook not far behind. Coho salmon swim beside the first of the winter steelhead. If that's not enough, there's a fly-fishing-only tailwater that offers year-round angling for resident rainbows that can go five pounds or more. And in summer, both browns and rainbows can be found in the headwaters. Each day, an angler has to decide which outstanding opportunities to take advantage of. That's life in the Rogue Country. [The Rogue] is one of the Northwest's richest streams, supporting large numbers of spring and fall chinook salmon, coho salmon, summer and winter steelhead, trout and other fish. The river's two main tributaries, the Applegate and Illinois rivers, support wild strains of anadromous fish that use the Rogue as a "freeway" before finding the right offramp for their home waters. 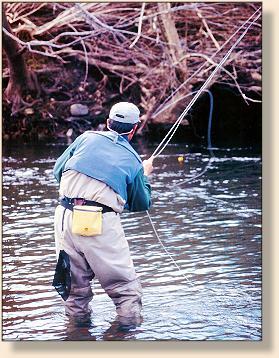 Seven kinds of fish are eagerly pursued by Rogue anglers. They are briefly described as follows. Half-pounders are unique to the Rogue, Klamath, and Eel rivers. They are 'bomerang' steelhead, homebody fish that don't wander far from their natal rivers. Like most steelhead, half-pounders smolt when they are about seven inches long and head for the ocean, usually between March and May. But instead of waiting two or three years before they return, the half-pounders come back to the Rogue the next fall, even though they are not sexually mature. Some may stay in the river another year, feeding like trout, before heading out again. Others return to the ocean in spring. And the next fall they're back as mature steelhead. . .The typical half-pounder is 12 to 16 inches long (and often weighs more than half a pound.) When they first return in the fall, they are aggressive and readily take a fly. After a few weeks in the river, they feed like trout again and can provide good fishing when pursued with winter fly-fishing techniques. 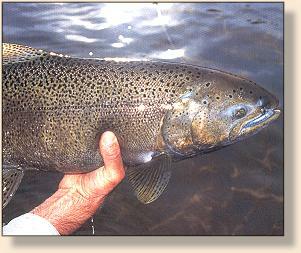 The typical Rogue summer steelhead is between 18 and 22 inches long - about three pounds on average. This relatively small size is due to the half-pounder life history: less time in the ocean means less time growing big off its rich feeding grounds. Today, about half the summer steelhead are wild, and the hatchery fish are descended from native Rogue steelhead. 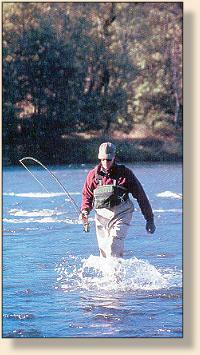 Summer fish enter the Rogue beginning in May, and can move upstream quickly. By July, there can be good steelheading in the Upper Rogue. Over the last ten years, the run has averaged more than 12,000 fish above Gold Ray Dam, with the bulk showing up in September and October. These months can offer superb fishing: sunny skies, fall colors, and bountiful fish. Summer steelhead spread throughout the Rogue system (except the Illinois River). Although most fish are in the two- to four-pound class, there are enough over five pounds - and a few over ten - to keep anglers on their toes. Winter fish enter the Rogue beginning in November. Fresh fish arrive December through March, and they spread through the river. Bright winter fish can even be found in April. The winter run is almost as large as the summer run. . . Over 80% of the Rogue's winter steelhead are wild fish. They spawn as early as December and as late as June, but the heaviest spawing is in March and April. Unlike the summer fish, they spawn in the mainstream. Winter steelhead tend to be larger than their summer-run cousins, partly because only 50% of them have a half-pounder life history. The Rogue supports a major run of spring chinook salmon. Most "springers" spend three years in the ocean, then begin their upriver journey between March and June. Runs vary between 10,00 and 80,000 fish. These salmon are typically 12 to 18 pounds, although there are larger ones, especially those that are wild. Nearly all of the Rogues's fall salmon are wild. Most are slightly larger than the springers due to the extra time in the ocean, some some are turely huge - forty, fifty, even sixty pounds. They enter the estuaries in July, and by August many are in the Grants Pass area. There are two distinct runs. The first comes early - August or even July - and is destined for the Middle Rogue and Applegate River; 40,000 fish or more can be in this run. A later-running strain is bound for the Illinois River. Spawning begins in early October. 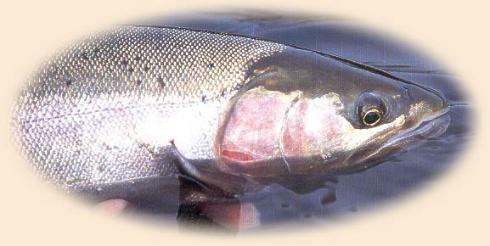 Coho salmon are smaller than their chinook cousins, weighing only six or seven pounds. They are fine fly-fishing fare. Unlike chinook, which rely on weight and brute strength, coho are hard-running fish that tend to jump. 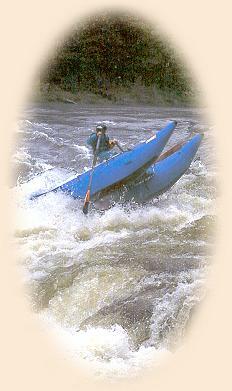 They head upriver beginning in September and October, and provide good sport through November. By late November, they are well-distributed throughout the Rogue and begin spawning. The run is about evenly split between hatchery and wild fish. Both rainbow and cutthroat trout are present in the Rogue, and there are even a few brown trout and brook trout above Lost Creek Dam. The Oregon Department of Fish and Wildlife puts its juvenile hatchery fish in the "Holy Water" stretch below Lost Creek Dam, but the rest of the river is not stocked. Trout are stocked in the lakes, however, and it is believed that someof them have either migrated or "leaked" into the river. Other rainbows are steelhead that lost the urge to migrate, and some are from ancient strains that persist in the headwater creeks. 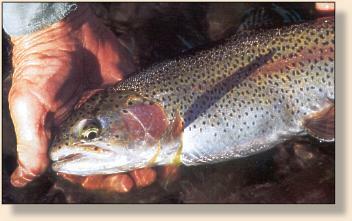 Cutthroat trout are present and tend to occupy slack-water pools with overhead cover. I've heard stories of four-pound cutts taken on flies; I've never seen one that big, but the tale-tellers seem like honest folk. There is a signficant run of shad that comes up the river in late spring. They reach as high as Rainie Falls. Few people fish for them, however. Both largemouth and smallmouth bass are present in Lost Creek and Applegate Reservoirs; a few leak into the rivers and provide a surprise to unsuspecting anglers. The river begins on the slopes of Mt. Mazama, the blown-out volcano whose deep caldera hold Crater Lake. At its beginnings, the Rogue is a mountain stream that sometimes meanders through grassy meadoes, sometimes rushes through thick forest of Doublas fir. Except for the summer tourist crush, the river is often uncrowded and possesses some lovely campgrounds, a few of them far enough from the road to muddle traffic noise. Access is good from State Routes 62 and 230, and some areas have scenic trails alongside the river. The so-called "Holy Water" section of the Rogue is open year round for fly-fishing only. It is a short stretch - barely half a mile long - between Lost Creek Dam and the salmon hatchery's diversion dam. Rainbow trout are stocked as fingerlings. Freed from competition from anadromous fish and protected from meat fishermen by catch-anc-release regulations, they quickly grow large in the rich tailwater. Most . . .fall into the 15 - 20-inch range. But there are some really big ones out there. The Upper Rogue offers the finest steelhead fly fishing on the river. Its pockets, slots, breaks, and runs are ideal water for enticing the sea-going rainbows to a well-presented fly. This 28-mile-long stretch of the Rogue runs from the Holy Water to Gold Ray Dam. September and October, the regulations permit fly-fishing only (but allow for a spinning rod with a bubble), and fall steelheading can be superb. 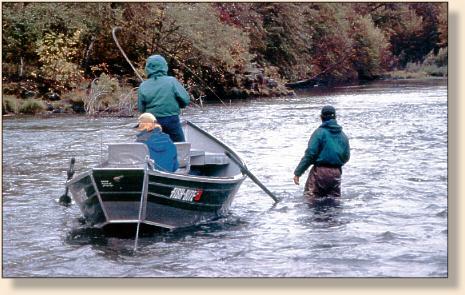 A good guide can have several days a year when his two clients will hook over 20 mature steelhead between them. Of course, there are also days when the count is zero; remember, we're talking about steelheading. The river is frequently over 150 feet wide here. It has a rocky, sometimes ledgey structure with frequent stretched of shallow water and occasional very deep pools. 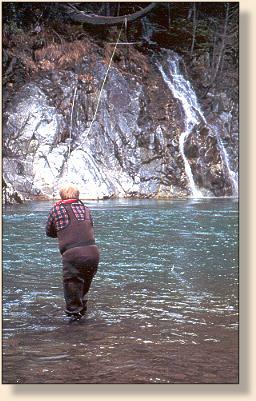 Steelhead are often found in short pockets behind and in front of rocks, in slots near the bank, and below breaks. In other words, if you're used to riffle-run-tailout steelhead drifts - the sort of water suited to a traditional wet-fly swing - you'll need to revise your tactics. The structure of the river, low water temperatures in the fall, spawning salmon, and some unique habits of the fish, combine to dictate a different approach than that used on more classic waters such as the Deschutes. The Upper Middle Rogue lies between Gold Ray Dam and Savage Rapids Dam. There isn't a lot of good fly water in this section. Also, roads are often rough, and private property restricts bank access. Hayes Falls and a diversion dam make boating treacherous between Gold Ray Dam and Gold Hill Park; drifters should not even attempt it. This section starts below Savage Rapids in Grants Pass and ends at Grave Creek. Although public bank access is often a problem, there is some excellent fly fishing in Grants Pass, if you don't mind the sounds and sights of town. Below Grants Pass, the river is mostly flat and not good for fly fishing until you reach the Whitehorse area. Salmon and steelhead bound for the upper river pass through here, and in fall the spring and fall chinook stack up near Grants Pass and begin spawning. This creates opportunities for steelheaders. . Huge jet boats carry tourtist through here in summer; after one of these noisy behemoths passes, fishing goes to hell for about an hour - just in time for the next big jet boat to come along. Between the jet boats and the rafters, fly fishers tend to avoid this section except and dawn and dusk and in the winter. The 33-mile Wild Rogue section, which runs from Grave Creek to Foster Bar, abounds with wildlife. In addition to bears and otters, you may spot deer, bald eagles, herons, kingfishers, mink, and many other animals. This section was one of the original eight "wild and scenic" rivers designated by Congress. The designation is intended to keep the river "free of impoundments and generally accessible only by trail," with "westiges of primitive America." For those who don't float the Wild Rogue, there is a trail that parallels the north bank, but there is no road access. Bankside camping is available in many places, and there are several rustic lodges for those seeking soft beds and a roof. Fly fishing in this section can be good, but you have to pick your water carefully; usually it is either too fast or too slow for good fly fishing. Another problem with fishing here is the river traffic. Because the canyon is narrow (on average, about half the width of the sections upstream), there are few places where passing boats will not run over your water. Also, this is a popular section for driftboat guides with gear-fishing clients. Most of them are a polite lot, but there are a few who think nothing of rowing right over the top of your fly. Some kind of anadromous fish can be found here at any time of the year. However, the chinook salmon (both spring and fall) are too big and fresh for fly rodders; as one expert put it, "they'll either spool ya, tow ya out to sea, or a sea lion will get 'em." 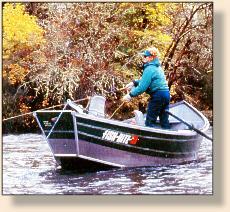 And winter steelheading is iffy because of frequent winter storms are always blowing the river out of shape. And the summer steelhead tend to travel through very quicly and not hold up; when it's good, it's incredible, but it can change from fantastic to horrible overnight. The Rogue is joined by two major tributaries, the Applegate and Illinois Rivers. Each supports signficant runs of fall chinook and winter steelhead, but each can be difficult to fish for widely different reasons. The Applegate is the gentler of the two tributaries. It is surrounded by private property for almost its entire length, and the river is unsuited for boating (trust me on this; I've tried it). However, there are several places where you can park you car and find a good fishing sport. The Illinois is completely different than the Applegate. The river is not especially broad, but it is deep - often 15 to 20 feet - and heavily bouldered. While many of the mid-river rocks are about the size of Volkswagens, many others are as big as three Buicks piled oil-pan to rooftop. And there are sudden falls and major rapids. 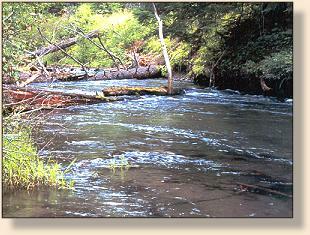 For a MAP of the Rogue River, click here. For the FLIES for the Rogue River, click here. To ORDER Rogue River direct from the publisher, click HERE. Credits: From Rogue River, part of the River Journal series, published by Frank Amato Publications. We greatly appreciate use permission.